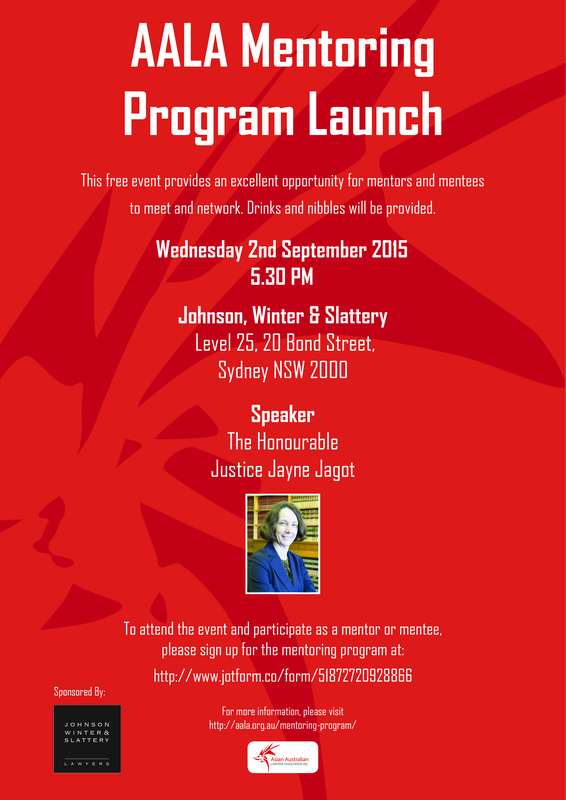 For participants in the NSW AALA Mentoring Program, we will be holding a launch event on 2 September 2015. Mentees and mentors are encouraged to attend to meet and network with other members. Note that this event will be open only to participants in the mentoring program in NSW. Applicant mentees will be contacted and advised of their allocated mentor before the launch date. If you would like to participate in the mentoring program, you can still apply by completing an application form by no later than Friday 14 August 2015. BottledSnail is recruiting acting talent for their next major theatrical production. BottledSnail Productions is a volunteer-run, not-for-profit organisation that creates and supports high quality creative projects within Melbourne. Recognising that a significant number of legal professionals will experience mental illness in their career, BottledSnail works to provide a creative outlet and a way to give back to the community. If you would be interested in applying, please click here for more details. Please see below event invitation from the Diverse Australasian Women Network. The event is hosted in partnership with the AALA. The 2011 census revealed that almost a quarter (24.6%) of Australia’s population was born overseas and 43.1% of people have at least one overseas-born parent. Asian Australians make up almost 10 per cent of the Australian population. In that context why is then that organisations and Government agencies are not reflecting such diversity in their leadership teams? There are growing calls for increasing women in leadership roles across all sectors with quotas or target to achieve the numbers for women in leadership positions. DAWN would like to see the debate to also include cultural diverse leadership. Please join us for the conversation to be held in Melbourne on September 3rd in partnership with the Asian Australian Lawyers Association. We are very grateful for the support of Ashurst the Leading International Law firm for hosting the event. Topic: “A unique resource: What Asian Australians have to offer in leadership context”. -Cheri Ong, Founding Chair Asian Australian Foundation and Board Member of Multicultural Arts Victoria. Kabo Lawyers has recently joined the Asian Australian Lawyers’ Association as a corporate member. The AALA would like to thank Kabo Lawyers for their support for the association and their commitment to promoting cultural diversity in the legal profession. Kabo Lawyers is proud to support the AALA as a small yet diverse practise where the minority is the majority! Bar News, the Journal of the New South Wales Bar Association, has recently published an article by Malcolm Oakes SC on William Jangsing Lee, the first barrister of Chinese descent admitted to the NSW Bar. The Asian Australian Lawyers Association is pleased to announce that global law firm, Baker & McKenzie, has recently become its first corporate sponsor. You are invited to join distinguished members of government, industry, judiciary, business, media and global leaders of international dispute resolution operating across a number of different cultures and legal systems in celebrating the Centenary of the Chartered Institute of Arbitrators (CIArb). The celebrations will be held during Sydney Arbitration Week and will include a Welcome Reception on Sydney Harbour; 3rd International Arbitration Conference (copresented with the Law Council of Australia and the Australian Centre for International Commercial Arbitration) culminating in a Black Tie Gala Dinner with the Hon Robert French AC, Chief Justice of Australia who will deliver the After Dinner Address. The event is not organised by the AALA, but AALA members are warmly invited to attend. AALA members may register for the event at the CIArb Australia member rate. 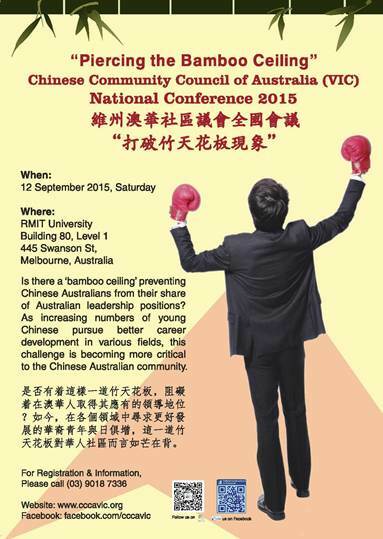 The Chinese Community Council of Australia will be holding its National Conference 2015 on Saturday, 12 September 2015. The theme of the National Conference is "Piercing the Bamboo Ceiling". Leaders from various fields including public life, business, community, media, academics and the arts have been invited to speak at the event. The Premier of Victoria, the Hon. Daniel Andrews will be opening the conference and Australian Race Discrimination Commissioner, Dr. Tim Soutphommasane will be one of the guest speakers. AALA President Reynah Tang and committee member William Lye will also be speaking at the event. This event is not organized by the AALA, however AALA members are warmly invited to attend. For more details about registration, please click here. The Asian Australian Lawyers Association would like to congratulate one of our members Charles Tan on his appointment as Magistrate to the Magistrates' Court. Mr Tan is Malaysian born with Chinese heritage, and is the first person of Chinese origin to be appointed a magistrate in Victoria. His appointment represents a significant milestone in working towards a culturally diverse judiciary. To read the official media release, please click here. If you have not yet done so, we would encourage you to apply for the AALA mentoring program as soon as possible. The program is open to practicing lawyers at all levels. To apply or to find out more, please click here. Applications close 24 July 2015 and the program is scheduled to launch for 12 August 2015.